Our milk is sold in 1-liter packs, and is 100% cow milk. It is processed by state of the art equipment under strict food safety and quality assurance systems all of which are ISO 22000 and HACCAP certified. 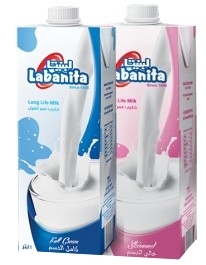 Labanita milk is available in Tetra Brik packages with each carton containing 12 packages. Labanita has a shelf life of 6 months and expiry dates are clearly indicated on all packages. Labanita milk is far more than just a creamer for your tea. The richness of our dairy milk provides an irresistible flavor, and can be enjoyed Full Cream or Skimmed.